Hydraulic compression tools for low voltage terminals and sleeves. Models up to 20 Tn. 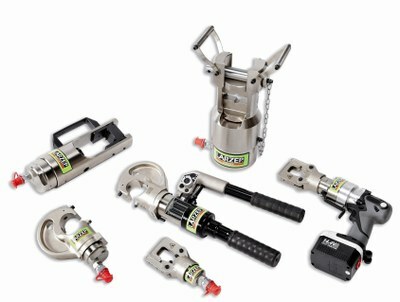 Hydraulic compression tools for medium and high voltage aluminium and steel terminals and sleeves. Models from 50 to 100 Tn. Available 3 models of hydraulic crimping tools: autonomous (CM), with battery (CB) and heads (CH). With audible safety valve to limit the crimping force. Models up to 20 Tn. Maximum working pressure 700 bar, except CB005 model: 450 bar. Interchangeable dies with model with the same capacity. Box included for easy transport and tool protection. CB, electro hydraulic portable tool with rechargeable battery, with rapid return trough the discharge mechanism. Models from 5 to 20 Tn. Two-stage CB012 model, suitable for deep indenting underground lines (16 – 240 mm²), as well as other general compression applications. Adaptors available. Supplied with 2 batteries 184V – 4 A•h, 1 charger and 1 safety belt. Accessories: 150W Inverter: for 230V equipment through 12 or 24V battery, to be used in cars, trucks,…; Adaptor to conect different equipment powered by battery. Input voltage 230 VCA, Output voltage 18 VDC. Maximum working pressure CB005 model: 450 bar. CM, hydraulic compression tool with integral pump. CM005 model lightweight and compact. Ideal for use in confined spaces. CM012 model, suitable for deep indenting underground lines (16 – 240 mm²), as well as other general compression applications. Adaptors available. Two-stage CM012C model, a fast one for terminal fixing and a slow one for the crimping action. CH, hydraulic compression head, with a quick coupler to connect to a hydraulic pump with a maximum working pressure of 700 bar. Models from 5 to 100 Tn. CH050D and CH100D are double acting models. Applications for 50 and 100 Tn models: Compression clamps and sleeves for: Aluminium conductors steel reinforced (ACSR), Aluminium conductors (AAC), Aluminium alloy conductors (AAAC), Aluminium conductors alloy reinforced (ACAR).